Please feel free to contact me for any question you have to fill in those missing details. I will edit the post and rephrase that. I was able to find the details eventually but VLUG might think about posting pics and the details of your collaborations on the website or some other central location. The stuff you all build is too good to get lost in the jubble! Keep up the good work, I love it. Hey, while we’re at it, how about some credits? The Gale Farmstead was built by Heath Flor. Gypsy Camp by Master Shifu Leo J. Tornado by ElBarto. 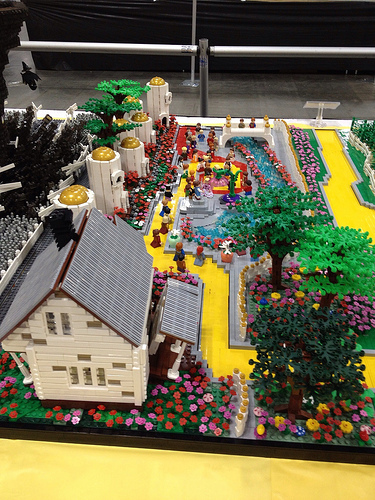 Munchkin Land by Chris Phipson, with the centerpiece flower by Leda Kat, and Dorothy’s wrecked house by Heath Flor. 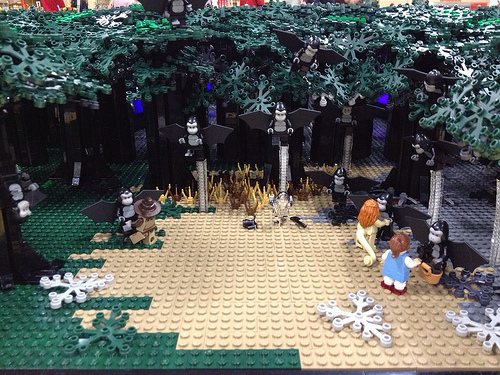 Scarecrow Cornfield, also by Chris Phipson. 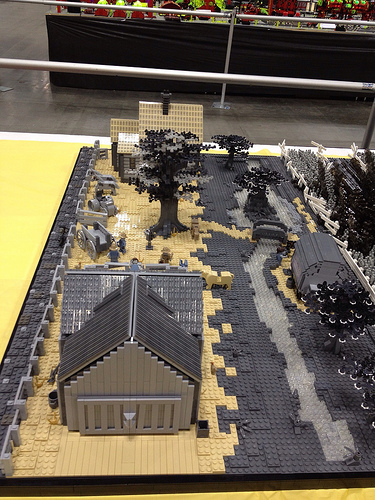 Tin Man’s Woods and Cottage by Tyler Halliwell. Cowardly Lions Wild Forest by Dave Kaleta. Poppy Field by Lee Jones. 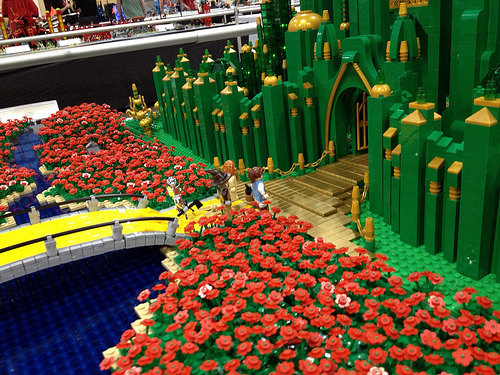 Emerald City by Adam Reed-Tucker. Dark Forest and Flying Monkey Attack by Lee Jones. 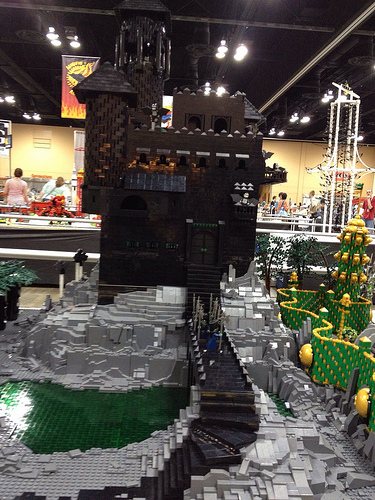 Wicked Witch’s Castle by Chris Phipson, rock work and landscaping by Mark Kelso. 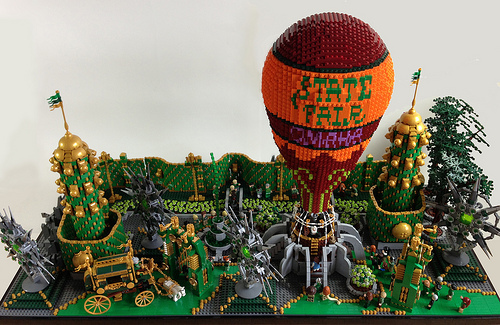 Dave Kaleta’s Emerald City and Balloon (winner of best airship). 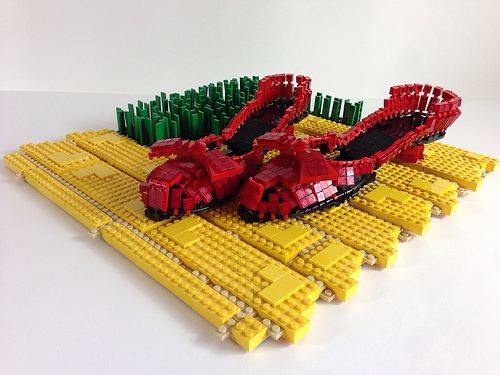 Ruby Slippers by Devon Wilkop. Miniland figs of the main characters by Tyler Halliwell. VLUG Movie Theater by Dennis Price. Figs throughout the build contributed by Hans Dendauw and Lee Jones. Winner of Best Group Layout. Wow, you guys sure are picky after the fact while simultaneously being more than a little disorganized in how you’ve presented your group layout online. Compare the excellent photos and clear descriptions that enabled me to write up the cyberpunk city layout very nicely to what Josh has had to deal with here. I’m sure you don’t mean to come across as whiny, but given the lack of information you all provided for us to work with on your photos, that’s what you’re both sounding like at the moment. ^I guess 8 photos and a video just isn’t enough, Andrew. Why don’t you try harder next time Josh. I mean, show a little respect! When a large layout is specified as being built by a named group (ie. VirtuaLUG, Vancouver LEGO Club, OneLUG, etc.) I generally give credit to the group name. Most of the time large groups want the focus to be on the build…not what individuals did within the build. My apologies if VirtuaLUG members want individual call-outs. As for the detailed information, I was eventually able to find it all but it took a couple hours of dedicated searching. If VirtuaLUG wants word of its exploits to be spread about then it should seriously consider consolidating the important facts and locating good pictures in a central location. I found that there was a VirtuaLUG Flickr group but there weren’t pictures there of the entire layout. ^ Not to stoke the flames, but Andrew all the info on who built the MOC is found quickly on MOCpages. However I also agree with Josh that pointing out the group and not the individuals who built it is simpler than listing all the contributors. 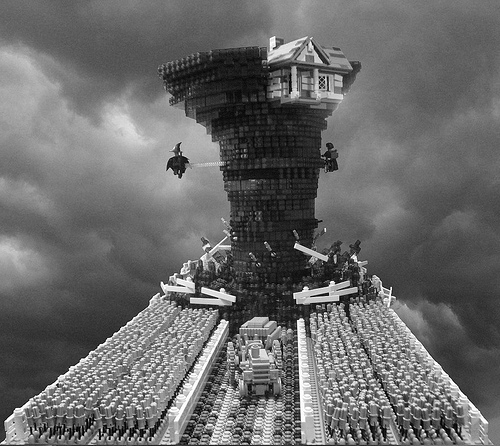 Besides I think most the builders here famous enough it is pretty easy to find who it was. Debates aside; cheers for the VLUG making it on TBB! Figuring out who built it wasn’t the problem. Dave and I had a good discussion offline that cleared up everything. Let’s move on.